The results from both weekends of the NDSA 2018 Championships are available on the event page. The results from the NDSA Teams Day 2017 are available on the event page. 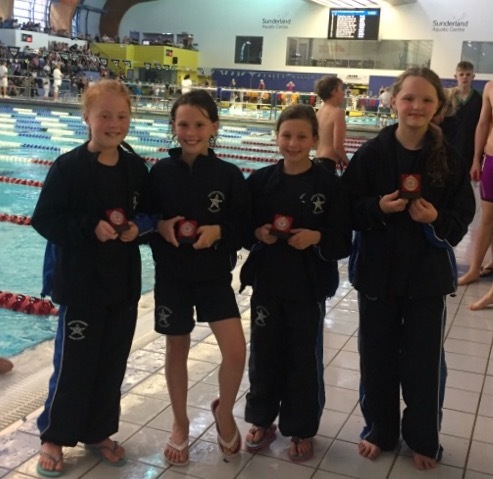 Well done to our Girls 9/10yrs 4 x 50m Freestyle Team - Abbie Orr, Molly Gould, Paige Hope and Georgia Black - bronze medal at the 2017 N&D Teams. The results from both weekends of the 2017 NDSA Championship are available on the relevant event page. The results of the N&D 2016 County Relays are available on the event page. The results from the 2016 N&DSA Swimming Championships are available on the event pages. The results for weekend one of the N&D SA Swimming Championships 2015 are available on the event page.